I thought Notch doors are always 3-hole, but later Variants from '67 and all Fastbacks have 2 holes. Both my Notchback's have 3 bolts, 63 and 72. Ah right!, Every day’s a school day!!! Thanks all!! 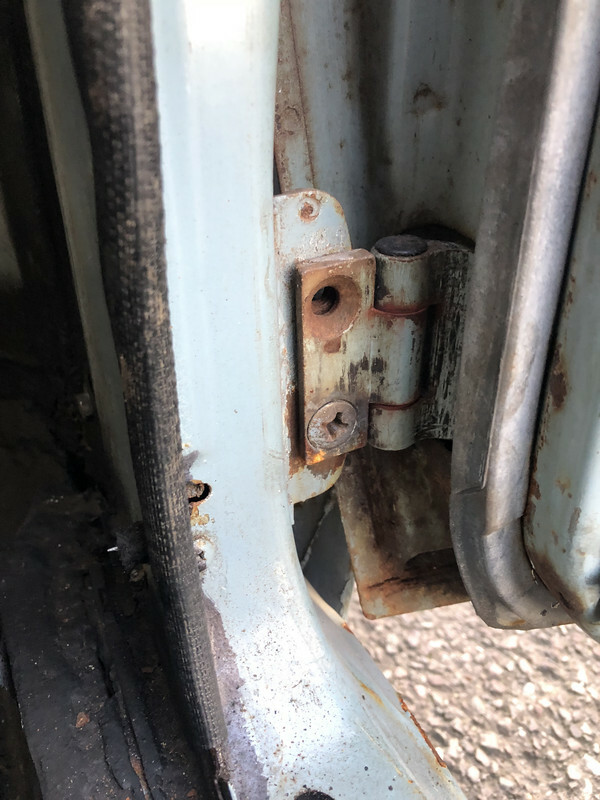 Aaah, gutted, my 40th on sat so can’t do it...could do with an early type three passenger door (2 hole hinge) if there’s one- i’ll Maybe see if anyone can swing by for me in that area. I have two early Type 3 passenger doors lurking in my shed - one NOS (bare) and one secondhand (complete). Both have the separate hole for the lock below the door handle. The NOS has no hinge plates, just the holes for the hinge pins to go through. The s/h has 3-bolt plates. Both are in reasonable but not perfect condition but I would have to get some other stuff out of the way to check them properly and photograph them. Theres a nicer fuel filler in Your Heap Dave! Is it worth saving the lenses off headlights even if reflectors are knackered? Headlight lenses are a matter of opinion. I have enough spare units so wouldn't bother, and I think rusty reflectors are more common than broken lenses. Somebody might want to, but not me - and I'm a hoarder! Good to meet a few people and put faces to the names. Lots of nice stuff for sale. Likewise! Maybe im living at half speed which is why it takes me so long to get stuff done? Now the dust has had a chance to settle and ive had time to take a proper breath. Id like to say a thank you to peter for his efforts, not just for this weekend but over the years. And to Darin and Tina, they were very pleasant and helpful people doing what must be very difficult and bringing back a lot of memories. But a large number of cars will continue to be on the road thanks to their dad. Sorry it's taken me so long to get to this guys! Massive thanks to all that came down- We had a highly successful weekend, to the extent that most of it now fits inside one side of the garage! I had a bit of a brainwave on Saturday night, that resulted in one representative of each club being invited to "rescue" parts that shouldn't go to the trader- Dave Hall came on Sunday & rescued a nice haul of parts for us, kgoc didn't send anyone, so I put together a couple of boxes for them. As I was clearing up the top shelf, I came across something that Gracie would appreciate, so it's going in the post today! I shall be raising a cup of strong coffee to Broady for the foreseeable future! It was Darin & Caren You met by the way Broady! Tina wasn't around at the weekend. Should have has a photo of you and your box of happiness!